Join us in our February quest for Kindness by performing random acts of local love within our wonderful community. An act of local love can take many forms. It might be as simple as saying hello to someone on the street, or as exciting as building a new community garden. At United Way Brandon & District, we are committed to channelling local love in all we do by igniting the desire in everyone to improve this community we call home. Whether that means helping a vulnerable child, working with isolated seniors or anything in between, it’s all about building connections and delivering support to the people and communities who need them, and we want to work with everybody to do that. Through United Way, you can mobilize people to address a local issue, collaborate with a network of partners to solve a problem, or give financially to support community programs. You can also take a personal challenge to add a bit more local love to your life and your community. We would love for everyone to join us in posting a copy of this calendar in their offices, homes, schools, and places of business so we can promote these wonderful gestures and help make the cold month month of February very warm hearted. We cannot wait to take part in this with the amazing members of our community who continuously support social causes and try and make change here in Brandon & District! Click here to download your calendar now! 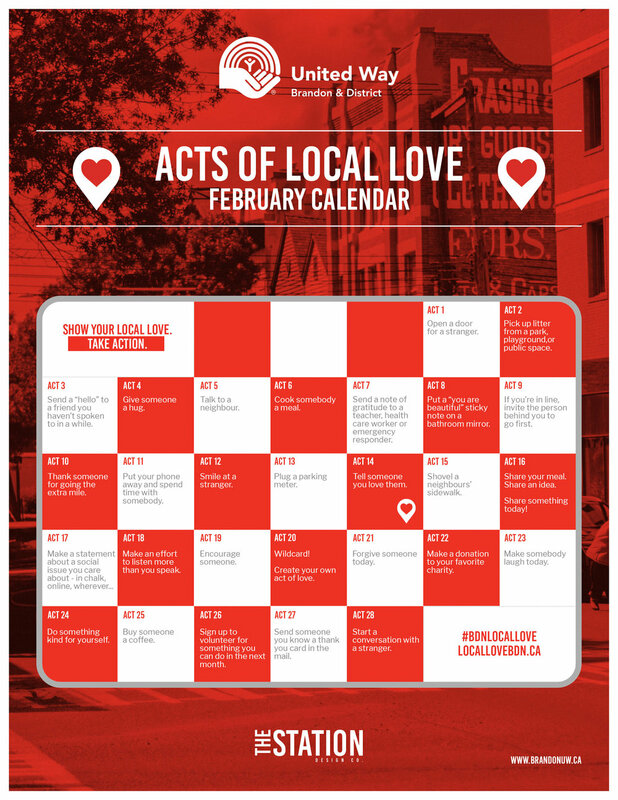 We will be posting every single day of our ‘Acts of Local Love’ Calendar on Instagram so it is as easy as just a Double-tap or a comment of Kindness to help us make February the best feeling month of the year. Join us in kindness, love, and happiness! Another great act of local love! Donations are a great way to show love to your community. 100% of your donation stays in Brandon & District.